I thought I must write to you because many people- including myself – have begun wondering whether there is someone who looks exactly like you who is going around impersonating you at important public functions these days. Please let me explain why we think so, Maithri. This week, we heard someone who looks just like you and dresses like you speaking at a function. He blamed many people for carrying out their duties. He was very angry and lashed out at officials in a harsh manner. 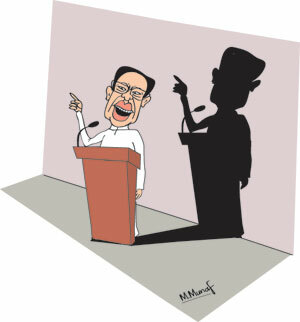 He couldn’t have been you, because there was no maithri at all in the way he spoke. This chap blamed officials for taking Gota and the former commanders of the Navy to court. He said that no one informed him about it until the next morning. He said that people serving in the independent commissions didn’t know what they were doing. He was being blamed for all this, he said. What was funny was that this chap went on to say that he was elected not to give telephone calls to judges or to influence the functioning of independent commissions. Well, in his speech, he has done just that by saying that the judiciary and the commissions were carrying out some political agenda! Pardon me if I am wrong, Maithri, but the Maithri we knew, the Maithri elected by a majority of the people in this country was elected not because they saw him as a great hero who was a brilliant statesman but because they didn’t like Mahinda maama’s style of government after winning the war. They didn’t like the fact that Mahinda maama’s family was involved in almost every aspect of running the country. They didn’t like the manner in which some ministers in his Government behaved, as if they were above the law. So, they opted for a drastic change and a majority voted for you. They thought they made the right choice when you said, immediately after taking oaths, that you would never run for the top job again. They thought they made the right choice when you changed the Constitution to establish independent commissions and prevent people from being President for life. Don’t get me wrong, Maithri, but even now, few believe that you are a great statesman who can make fiery speeches and inspire the masses. But they were impressed with your simplicity and humility and your willingness to work with the Greens – even if it meant forgetting years of political rivalry. You blotted your copybook by appointing candidates who were defeated at the general election to Parliament through the National List. That told us that you were still a politician looking to survive in the squabbling Blue party rather than a confident leader. Still, most people were willing to accept that. That is why, Maithri, this speech by the chap who looks just like you is confusing. He says he should be informed whenever some important person is being taken to courts. Just imagine what your day will be like if, every morning, you had to go through a list of people who were being taken to court! And you have clearly told us that you are not the type of person who would telephone judges, ask the Attorney General to drop charges or influence the functioning of the independent commissions, so what is the purpose of informing you that someone like Gota was being taken to court anyway? Maithri, you should find out who this chap who looks just like you really is. He is attending public functions pretending to be you and saying things that we never expected you to say. He wants to be told whenever a VIP is being taken to court and he was annoyed that Gota was being harassed. The things that this chap said the other day made him sound just like Mahinda maama. So, are you sure this is not someone sent by Mahinda maama? Remember the ‘duplicate’ Sirisena who looks and dresses like you who was used by Mahinda maama during the last elections? This could be him! If this chap carries on in this manner, judges won’t feel free to take the right decision and the independent commissions will not be independent. Worse still, the public will think that this is all your fault and try to get rid of you in the same way that they got rid of Mahinda maama! Maithri, it shouldn’t be too difficult find out who this chap is because after what he said the other day, I am sure the Police will do exactly what you want them to do. Who knows, they might even inform you, before taking him to court! PS:At a time when many people are blaming you for all this, there is a trick that will restore their confidence in you, Maithri: tell us what really happened with Daham at that night club and charge him if he is thought to be responsible. Namal is being charged every day, Ramith was charged the other day, so it is time to show that you don’t interfere with the Police and everyone is equal before the law!